Happy spring everyone! It's officially here today even though snow is in the forecast for tonight! 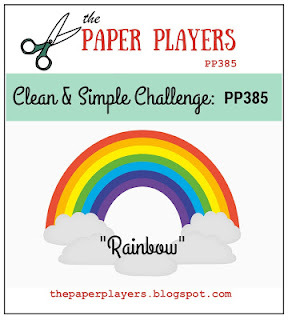 Nance Leedy has a fun rainbow plus CAS theme happening at The Paper Players challenge! Whenever I play with alcohol inks, I feel like there's a rainbow effect that results. 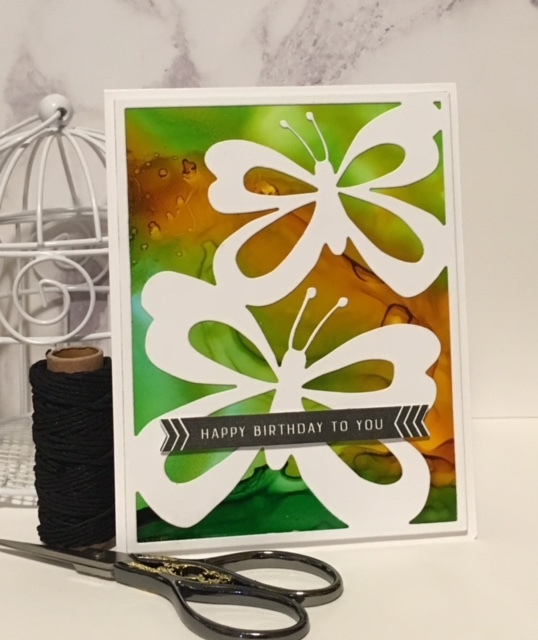 I already had the background and sentiment on my leftover pile, so a quick die cut of the butterfly cover plate and this card was completed! STAMPS: Direct Messages by Papertrey Ink. PAPER: Yupo by Ranger; White by PTI. INK: Versafine Onyx Black -stamped twice using MISTI. DIES: Butterfly cover plate by PTI; Direct Messages by PTI. MAR 20 - "Where there is love, there is joy." What a great background Wanda - I love the swirl of colour behind the white diecuts. How wonderful to achieve such a unique effect each time. Thanks for joining us over at The Paper Players this week!